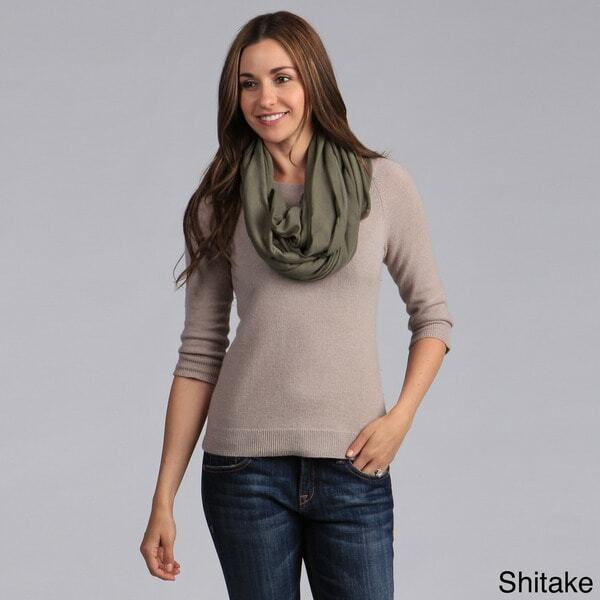 This trendy scarf features fashionable rolls and a short hem. This stylish, lightweight scarf is the perfect staple for your wardrobe. I purchased three of these scarves and am pleased with each color, red, ivory and lavender. They drape nicely and once you get them folded the way you want them they look very nice. The scarves have a raw edge, not a big problem with the fabric used, but I turned them inside out and stitched them. No big deal to do so and really not necessary if you don't sew, but I'm happy with the change. A great accent at a terrific price. The scarf is alright for just lounging around (at home, in bed, running), but looks more like a pajama style and not particularly substantial. Thin weight and jersey with unfinished edges. I was thinking of giving it as an extra gift to my sister in law for Christmas, but it was so flimsy and sort of "blah", that I just kept it. It was cheap enough that I didn't feel like returning it or going through the hassle. If you want something to just put on to snuggle around in, this is fine. Nothing special. The scarf was really nice just too long for my taste, I felt lost i it because I’m short, but the scarf itself was very nice. I have 3 daughters and I bought them each a scarf as part of a Christmas present. My daughter loved this scarf and I love how it looks on her. Nicely packaged when arrived. The feel is very smooth and the color is great. The stitching is great, no threads were hanging off. I recommend washing by hand and hang dry. Does dry rather quickly! Purchased as gifts for teachers for preschool. They are an easy gift that is fashionable and on trend and anyone would welcome one into their wardrobe. This scarf is cute! I need to order more! Love this scarf, very stylish and comfortable. I purchased a tan and a black one. The tan one did shed a little because I put it on with a black wool coat. Just have to remember to wear the black with the black coat. Great purchase!! Love it look beautiful it has become a new go to scarf it very light weight and is a great addition to anyone closet hope they love it as much as I do!!!! We got this in Ivory for our daughter. The material is quite thin but it will work for an accessory. This a nice gift very stylish. I purchased 2 of them and will make nice Christmas gifts for my granddaughter! "will you be getting the sapphire color back in stock soon?" Hello mirataylor, items are restocked as they become available; however we cannot guarantee an item will be restocked. Thank you for shopping with us.